Add high-powered sound and style with the Pyle Street Flow BoomBox! 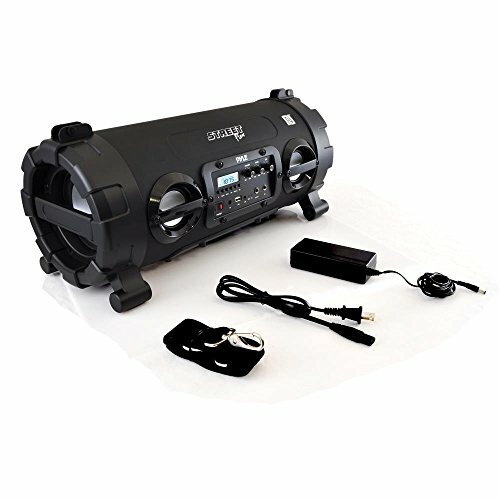 This Bluetooth speaker system features wireless music streaming along with built-in LED lights that pulse to the music. Enjoy full-range stereo sound along with a visual display that'll help the beats flow! Connect & stream audio from all of your favorite devices (like Smartphones, Tablets, Laptops, etc.). Built-in rechargeable battery adds convenient portability and lets you stream music for up to 4 hours without recharging. It's jam-packed with music streaming options like NFC Android Pairing, FM Radio, USB Flash Drive Reader, along with an Aux (3.5mm) Jack allowing you to connect and stream audio from even more external devices. Play your music while the lights glow with the Pyle Street Flow!